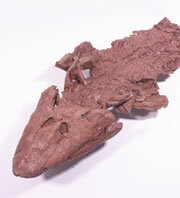 The fossilized remains of Tiktaalik show a crocodile-like creature with joints in its front arms. These extremely well-preserved fossil remains were found on Ellesmere Island, a Canadian island lying within the Arctic Circle, and date from some 383 million years ago during the Devonian Era of Geological Time. They are of a predator that had sharp teeth, a crocodile like head and could grow to a body length of some 2.75 metres (9ft). The word Tiktaalik (pronounced "tic-TAH-lick") refers to a "large freshwater fish seen in the shallows" in the Inuit language. The fossil finds - billed in some newspapers as "one of the most important fossil finds in history," have caused excitement because Tiktaalik roseae had a skull, neck and ribs similar to early limbed land animals, (known as tetrapods), but also featured several defining characteristics of fish such as fins, scales and a relatively primitive jaw. Scientists have been on the look out for the fossil remains of animals that could provide a practical example of the previously recognised missing link in the understanding of evolution concerning the transformation of the original aquatic life forms into life forms that lived on the land. The finding of such a possible missing link candidate does something to strengthen the case for evolutionary theory as being the explanation for biological diversity and also does something to undermine the case of people who insist on Creationism or on Intelligent Design as being the explanations for the origin of diverse life forms. Proponents of Creationism and of Intelligent Design, who often hold a literal biblical view on the origins and development of life, have often tended to claim that there are too few "transitional fossils" to support the argumements of the evolutionists. Neil Shubin, an evolutionary biologist and one of the leaders of the team that, over some six years of expeditions, discovered the fossil remains maintains that "Tiktaalik blurs the boundary between fish and land-living animals both in terms of its anatomy and its way of life." Another leader of the discovery project, Ted Daeschler, curator of vertebrate biology at the Academy of Natural Sciences, has described the find as "a dream come true" outlining how the team had prospected within the Canadian Arctic circle because "we knew that the rocks on Ellesmere Island offered a glimpse into the right time period and were formed in the right kinds of environments to provide the potential for finding fossils documenting this important evolutionary transition." Farish Jenkins, also an evolutionary biologist, said the creature's skeleton could support the weight of its body both in shallow water and on the shore and that "this represents a critical early phase in the evolution of all limbed animals, including humans - albeit a very ancient step." The continents drift across geological time often through being pushed by volcanic and earthquakes activity that themselves arise from forces at play in the Earth's crust and underlying mantle of molten rock. The strata within which the remains of Tikktaalik fossilised could well have been under the Equator when Tiktaalik lived in small streams and in a subtropical climate. The fossil remains bear witness to a big, curved, rib cage that suggests the existence of primitive lungs. True fish have no necks to allow their heads to move independently of their bodies - these fossils do have such a neck. The fins borne by these fossils also feature anatomical details that are readily associable with the shoulder, upper arm, elbow, forearm and, (although more vestigial), a wrist. Neil Shubin even went so far as to say of a Tiktaalik fin that a "it basically looks like a scale-covered arm." Shubin also said that "here is a creature that has a fin that can do push-ups," and that "this is clearly an animal that is able to support itself on the ground." Thus it is reasonable to suggest that these fossil remains may well give evolutionary biologists a new understanding of how fins turned into limbs or legs. The fossil remains so far discovered include one nearly complete front half of a fossilised skeleton but do not include reliable details of the hind fins and tail of the creatures body. Given this fact the scientists suggest that Tikkalik would have lived mainly in water but could have moved like a seal on land. Tikktaalik was a meat eater so the forces driving the species onto land can be speculated upon as to whether they did so to scavenge, to hunt, to breed or to escape their own predators. The fossil rich Devonian rock strata of Ellesmere Island are in a desolate area difficult to get to and are only conveniently open to research for one or two summer months each year. The research team do intend to further examine the area in search of fresh discoveries. Tiktaalik is expected to become as famous a fossil as an icon of evolution in action as Archaeopteryx, the feathered creature linking ancient reptiles and birds.